Did you spend all your money on holiday presents, and you're now finding yourself dreading another New Year's Eve on the couch, watching a televised ball drop, or going deeper into the red with a pricey ticket to a big event? With these free events in New York City, you can kick off the new year without doing either. Brooklynites are excited about their first New Year's Eve ball. This huge event is free, but requires a ticket for crowd control purposes. Starting at 6 p.m., Grand Army Plaza will fill with revelers who can listen to music, munch on food-cart fare, and watch the Brooklyn Ball ascend. The 4,418-pound ball measures 10 feet in diameter and is made of carbon, fiber, metal, and LED lights. It will rise 15 feet each hour starting at 7 p.m. until it reaches its zenith at midnight. As the clock strikes 2016, the ball will rain confetti and a special TBA surprise. Insiders know the cheap way to cruise the harbor is on the free Staten Island Ferry. Take it on New Year's Eve, and you'll see fireworks in Brooklyn, Manhattan, and New Jersey with spectacular water-side views. Bundle up and get there early to ensure a good spot. 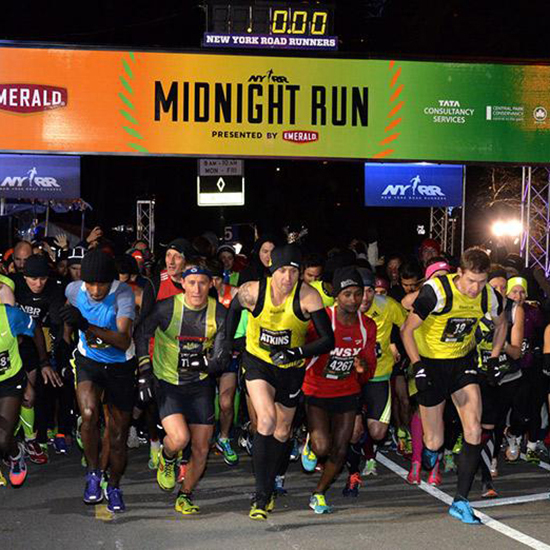 While most New Yorkers will begin 2016 cozily inside, glass of something festive in hand, others take off running through Central Park at the stroke of midnight. If you can't afford the $60 to run with the New York Road Runners—even though the money supports causes like the Central Park Conservancy—you can support them as a volunteer. Organized runs need tons of volunteers to help out. Alternatively, just show up for the free DJ, live performers, and fireworks. Recent events around the world are making many folks crave peace. Ever since Leonard Bernstein started the tradition in 1984, Saint John the Divine has presented a Concert for Peace on New Year's Eve. Bask in candlelight in one of New York's great cathedrals while listening to Judy Collins and Jason Robert Brown. The show starts at seven. Seating is first come, first served, so show up early. Join Fashion Avenue News Magazine for their fourth annual free party. These people are serious about fashion, so dressing to the nines is recommended. Men in tuxes go to the front of the line; anybody in jeans goes home. Tickets are free but limited, so order ahead. Get 2016 off to a reggae and Afrobeat start at Angel of Harlem's "Kiss Me at Midnight" Party. The party features Superhero DJ Jon Quick, a complimentary champagne toast at midnight, and semi formal dress code. You must RSVP to get a free cover. Bikers and skaters are invited to a bike ride and outdoor after party, with the ride kicking off at 9:45 p.m. on the Brooklyn side entrance to the Williamsburg Bridge, or at 10 p.m. at Manhattan's Washington Square Park Arch. The ride ends at Belvedere Castle at 11:45 p.m., where participants move on to a big dance party. Don't bike or skate? Then just plan to dance. Dress festively and bring food, drink, and noisemakers to share. For a sophisticated beginning to the New Year, join William K. Trafka as he performs the works of Mendelssohn, Bach, and Widor on St. Bartholomew's grand Aeolian-Skinner pipe organ, one of the city's greatest musical treasures. At midnight, he'll play his own transcription of "Fanfare for the Common Man." Brought to you by the Mid-Manhattan Performing Arts Foundation at Saint Bart's. New York's many yogis can great the new year with asana and breath work. The famous and beloved Jivamukti yoga studio offers chanting of sacred mantras from 8 p.m. to 9 p.m., followed by three hours of silent reflection. This is a sure-fire way to avoid a New Year's Day hangover.